Ever have those Tuesdays that feel like a Monday? Today was that day. But as I passed by the fridge on the way to make the salad, the broccoli and the turkey, the ubiquitously screw-capped bottle of Australian Shiraz mocked my self-control. Leave it to the Aussies to make it that much easier. (Side note: This was also a bottle a friend brought over for dinner, so I have a little wine guilt about not opening it for the dinner. Definitely a Ms. Manners faux pas I decided I could erase if the bottle went away). As many are, I was a little leery of the cap and the painstakingly clever and designed label–the French would never stoop to the low of putting a cartoon on a clever-titled wine. And to label it, The Boxer? “Pshaw” (huffed with a French accent). But as soon as the first taste went past my lips, and my mouth hummed in recognition of the heat-filled berries of a McLaren Vale Shiraz, I felt the honor of our brethren to the way, way South redeemed. Cooked, fruity and jammy, the plum flavors danced against some deeper spice notes of oak and chocolate. Medium tannin, medium acid, the wine had a nice medium (sense a theme?) finish to it. However, the alcohol, in tune with the heat from its origins, was slightly high (Translation: 15.5% alcohol). Overall, the wine was balanced, on its toes, and ready to take on the night or any red-blooded protein, if even a little tipsy. 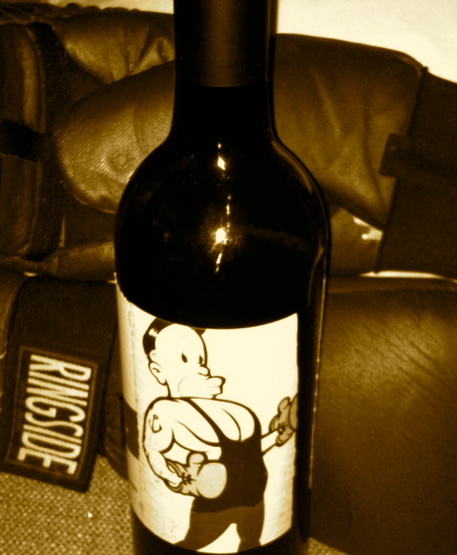 I’m glad I worked out before drinking “The Boxer” because I could easily lose myself in the bottle. Ping that friend to call you in the morning to make sure you work out if you take home this bottle, because at Australian prices, this wine is definitely more lover than fighter — you might not want to get out of bed in the morning either way. ← Did someone say “Working Class?” I’ll drink to that!